It’s been ten years since King Kong fell from the World Trade Center. Turns out he’s been in a coma all this time. Dr. Amy Franklin (Linda Hamilton) is concerned that Kong’s blood won’t keep him alive much longer without an artificial heart and a transfusion. As luck would have it, Hank Mitchell (Brian Kerwin) is wandering around the jungle when he just happens to find a female giant ape. I’m sure this will end well for everyone. The 1976 remake of King Kong wasn’t exactly a debacle. It still has fair reviews to this day and it made some money. It is, however, overshadowed by its own hype campaign courtesy of Dino De Laurentiis. The infamous producer promised that Kong would be realized on screen by a gigantic hydraulic puppet. Dino couldn’t deliver on that promise. There is a giant hydraulic Kong at moments in the film but it is ridiculously stiff. Most of the time Kong was portrayed by Rick Baker in an ape suit. Ten years later De Laurentiis finally made a sequel with no pretension of changing cinema through technology. The secret that Arby's doesn't want you to see. 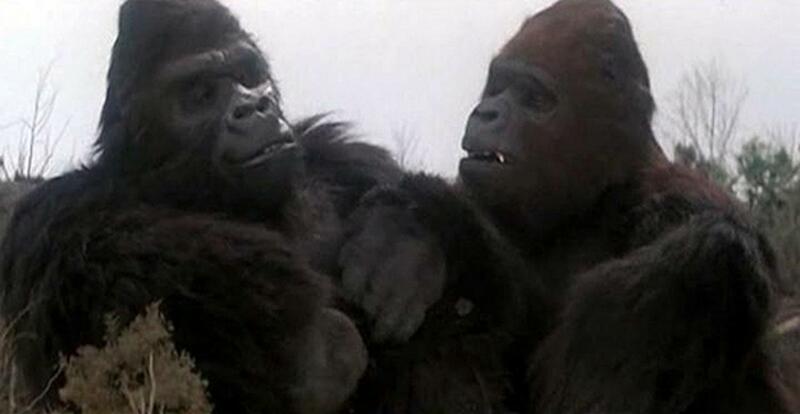 King Kong Lives isn’t a promoted as a comedy, but it certainly feels like one. This movie brings us giant ape open heart surgery with a massive artificial heart, Kong/Lady Kong romance, a cartoonishly evil general, and some even more cartoonishly evil rednecks. Director John Guillermin goes so far as to have Kong engage in snapping alligators in half, and eating people. Just so you know how seriously he's taking things, he also stages a scene from the perspective of a bullfrog. Even accounting for ten years of inflation, King Kong Lives was made for a fraction of its predecessor's cost. The effects are a mixed bag, the miniatures are often great, but much of the green screen work looks shockingly terrible even for 1986. Peter Elliot and George Antoni manage to evoke sympathy for the Kongs through their portrayals even if the choice to linger on the costumes goes on too long in parts and reduces the suspension of disbelief. Near the end Lady Kong gives birth. Kid Kong is far less successful and is maybe the biggest letdown in the whole film. It looks just like a common ape suit, there’s nothing babyish about him. I always felt that he seemed way too small as well.Turns out, there was a reason for this, Dino De Laurentiis had an idea to spin-off Kid Kong into his own animated television show where he could change size at will and travel to other planets. This never materialized but its further proof that Dino does not dream small. The Kongs, this fall on NBC. Linda Hamilton as Dr. Franklin is reduced to chasing King and Lady Kong around while watching the action from a distance. She gets a few decent scenes and tries her best to demonstrate real concern for the Kongs' plight. The low point for her is initiating an ill-advised sleeping bag frolic with Hank using the immortal line, “Yeah, why not... we're primates, too.” The other stand-out actor is John Ashton as Lieutenant Colonel Nevitt. He’s a mustache-twirling evil jerk-off, and it’s a delight to watch him get smashed into the ground. King Kong Lives isn’t good, but that’s of little concern. It’s fast-paced, fun, and ridiculous in a perfect Saturday afternoon matinee kind of way. 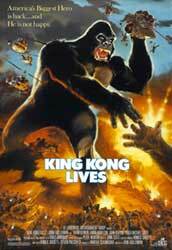 It promises giant ape destruction, love, tragedy, and a crushed Lamborghini and sometimes that’s all you really need.